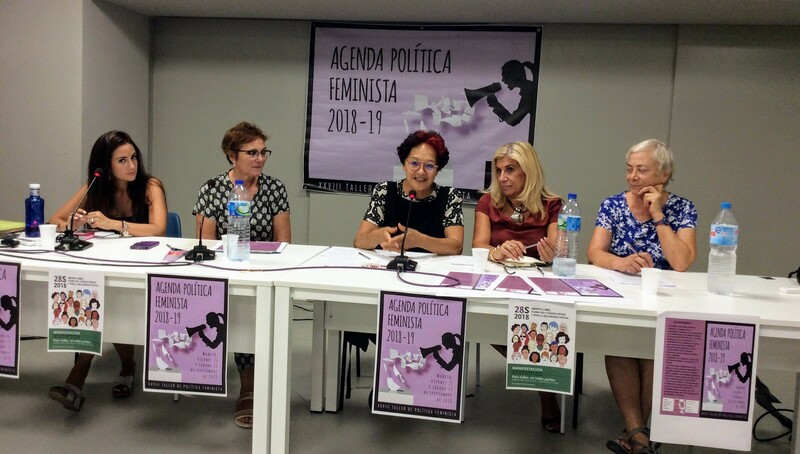 Euromed Feminist Initiative participated in the annual meeting of the Feminist Policy Forum that took place on the 21st and 22nd of September in Madrid, with the slogan "Feminist Political Agenda 2018/2019". The different panels that gathered women's rights activists, trade unionists and academics were very interesting in terms of quality and diversity of the speakers and subjects. The open and warm atmosphere facilitated the exchange of experiences and created lively debates among feminists from different communities and backgrounds. Ms. Lilian Halls-French, Co-president of Euromed Feminist Initiative discussed the common challenges and obstacles women face in the Euromed region and shared the agenda of EFI for the next months which mainly focuses on violence against women. The problems of different countries were illustrated by all the thematics of this meeting such as: the gap between the adoption of laws and their implementation, the lack of political will, the difficulty to ensure the involvement of women's rights CSOs as interlocutors in the political processes as well as lack of finances for adopted measures in favor of women's rights. Among the strong outcomes of the meeting were the need to strengthen the cooperation thus the capacity of action and the common will to develop the connections with the the diverse components of the democratic movement.